What is OHSAS 18001:2007 Health & Safety Management System? Certification Europe is an accredited certification body which provides International Organisation for Standardisation (ISO) management system certification and inspection services to organisations globally. We hold OHSAS 18001:2007 accreditation with both the Irish National Accreditation Bureau (INAB) and United Kingdom Accreditation Services (UKAS). 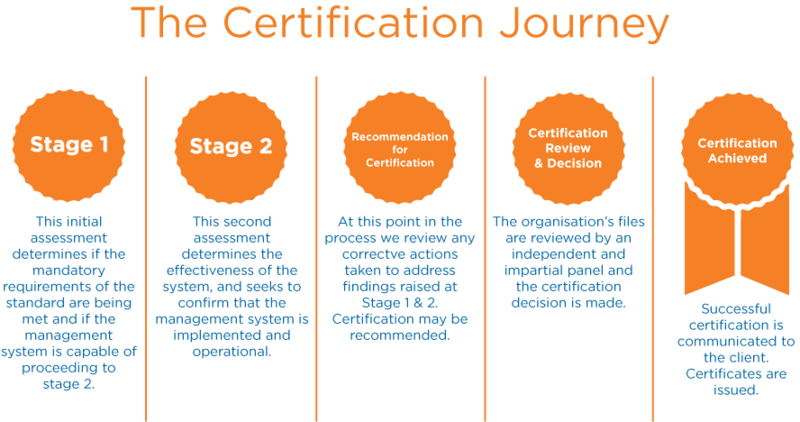 Accreditation is the process by which a certification body is recognised to offer certification services. In order to become accredited, Certification Europe is required to implement ISO 17021 which is a set of requirements for certification bodies providing auditing and certification of management systems. Certification Europe is audited annually by our accreditation bodies to ensure our services meet the exact requirements of the relevant accreditation standards. What industries implement OHSAS 18001:2007? OHSAS 18001 is implemented by a wide variety of industries. The Health and Safety standard can benefit any organisations that choose to implement it. If you have a workforce of 5 or 500 then OHSAS 18001 will benefit you immediately. The purpose of the management system is to put the focus on the employees and ensure best practices are being implemented. Effectively implementing the standard results in a safer working environment for your workforce, plus reduce risk and liability exposure on the organisation. Certification Europe can provide in house training for your staff on implementation and auditing your systems internally to OHSAS 18001. Contact our team today to learn more. Certification to OHSAS 18001:2007 lasts for three years and is subject to mandatory audits every year to ensure that you are compliant. At the end of the three years, you will be requested to complete a reassessment audit in order to become recertified to the standard. ISO 45001 is now replacing OHSAS 18001: 2007. Contact us today to learn how your organisation can become certified. ISO 45001 Migration Policy Now Available. Download our FREE ISO 45001 Migration Policy. Bespoke and In-House ISO Training Our bespoke training programmes cover all aspects of ISO implementation and auditing. OHSAS 18001 Health and Safety Certification Accreditation Overview Learn about OHSAS 18001 Health and Safety Management certification. The eagerly awaited ISO 45001 Occupational Health & Safety standard has now been pushed back to a November 2017 launch at the earliest. Detailed Proposal Firstly, complete our online application form to give us an understanding of your business requirements and desired timescales to achieve certification.